Double deck Pinochle is a variation of the game that involves using twice as many cards. This form of Pinochle is usually played with six players instead of three or four. The object of the game, which is to take tricks and form melds, remains the same. 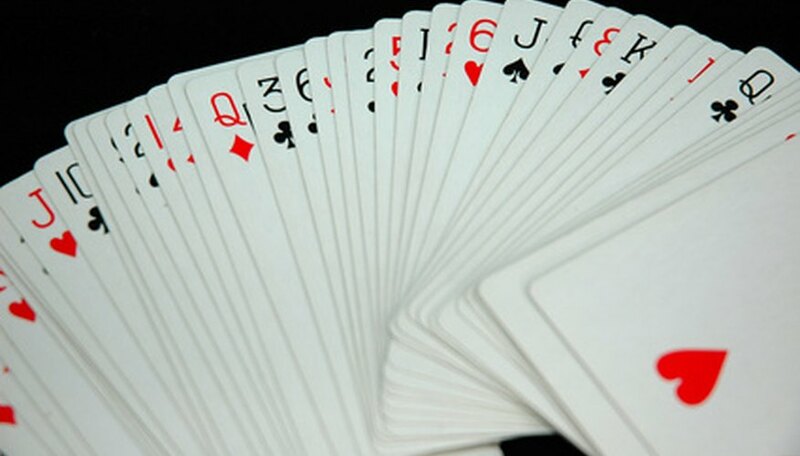 A standard Pinochle deck consists of 48 cards made up of two sets of the nine, ten, Jack, Queen, King and Ace in all four suits. The Ace is the high card with ten coming next followed by the King, Queen and Jack. A slight modification is made to the deck for double deck Pinochle. Prepare the decks. Combine two Pinochle decks and remove all the nines. Or you can mix four regular decks of 52 cards and remove all the numeric cards two through nine. Form your teams. Each player will have a partner who will sit across from them for a total of three teams. Deal the cards. The dealer will have the player on his right cut the cards then he will deal all of them moving clockwise. Each player gets 20 cards. Many Pinochle dealers will deal three cards at a time. Hold the auction. The player to the left of the dealer will give the opening bid. In double-handed Pinochle, the minimum bid is 50. From 50-60, the bidding goes by increments of one and after 60 it goes by increments of five. Each player will bid on the number of points they think their hand will take. Each bid must be higher than the last and any player has a right to pass. Once he passes, he cannot bid again. The player with the highest bid wins the right to declare the trump suit. If no one bids, the bid is dropped on the dealer and she must make an automatic bid of 50. Meld cards. The winning bidder will meld first. This is done by placing combinations of cards face up on the table. The types of melds are: arounds, marriages, flushes and pinochles. Arounds can be made with four face cards of different suits. There are two types of marriages; a trump marriage, which is the King and Queen of the trump suit and a regular marriage, which is the King and Queen of a non-trump suit. A flush is the Ace, Ten, King, Queen and Jack of the trump suit only. Pinochle is the Jack of diamonds and the Queen of spades. A double Pinochle is both the Jack of diamonds and Queen of spades. A triple Pinochle is three Pinochles. A quadruple Pinochle is four Pinochles. Score the melds. When everyone has laid down her melds, count up the points and combine the scores of team members. Melds are scored as follows: Aces around: 10 points, a double aces around is 100 points, a triple aces around is 200 points and a quadruple aces around is 400 points. Kings around: 8 points, a double kings around is 80 points, a triple kings around is 160 points and a quadruple kings around is 320 points.Queens around: 6 points, a double queens around is 60 points, a triple queens around is 120 points and a quadruple queens around is 240 points. Jacks around: 4 points, a double jacks around is 40 points, a triple jacks around is 80 points and a quadruple jacks around is 160 points. Trump marriage: 40 points. Marriage: 20 points. Flush: 150 points. Pinochle: 40 points. Double Pinochle: 300 points. Triple Pinochle: 450 points. Play for tricks. The winning bidder leads the first trick. Going clockwise, all players must follow suit unless they do not have any cards in that suit. If you do not have a card in the lead suit and you have a trump card, you must play the trump card. The highest card in the suit wins unless a trump card is played. If more than one trump card is played, the highest of the trump cards wins. Play until all the cards have been played. Remember that 10s beat everything except aces. Score the tricks. Each player counts the points in the tricks they won. Aces, Tens and Kings are worth one point. The team who wins the last trick gets two extra points for that trick. Combine the scores of team mates and add it to the points in your melds. If you have made your collective bid, then your points are added to your score. If you have not made the bid and have been "set" then your meld and trick points are not counted and the amount of your bid is subtracted from your current score. For in-depth information about scoring, refer to the resources. The teams that did not win the bid still score their tricks.